This is another symbolization of the dual principle. The upper half of the figure symbolizes the Sun as the male principle and the lower half the Moon as the female principle. This is corroborated as in the previous tablet by the symbol of the Creator (See 5.) on each side of each face. Below the upper symbols of the Creator are two lozenges or enclosures reading: “one is two and two are three.” The lower face symbolizes the Moon as the female principle. Thus the Sun and Moon in this picture are shown symbolizing the dual principle of the Creator. 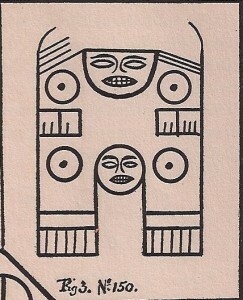 Below the moon on either side are two glyphs (See 4.) both of which read “five,” the full godhead all in one. When a temple or pyramid was dedicated to the Sun, it was to the male principle of the Creator and when dedicated to the Moon it was to the female principle. Thus in both cases the dedications were to the Creator and not to the Celestial Orbs. They were only used as symbols.